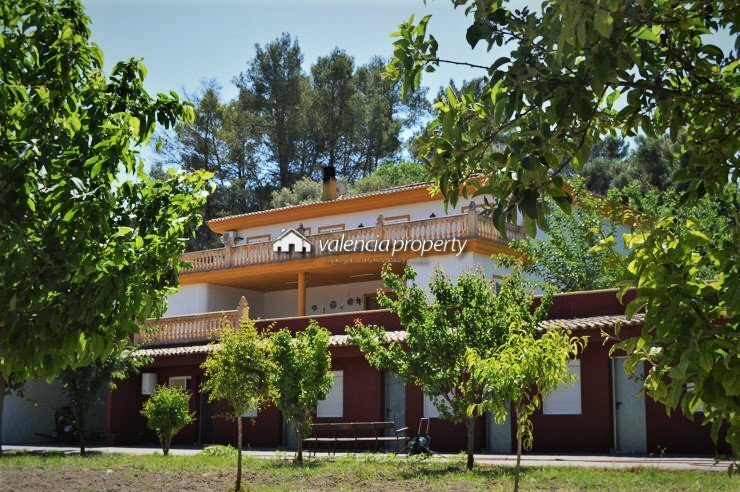 Cottage situated between orange groves near the town Lugar Nuevo de Fenollet, just 6 km from the city of Xàtiva, in Valencia. The plot is 1,734 sqm with fruit trees of different varieties: orange, lemon, pine, etc. Access is via an enterely paved road up to the door of the entrance. The entire perimeter is fenced and there is built the house, pool and a shed that serves as a garage and storage. The house inside has a living room with fireplace, 1 bedroom and a well-equipped kitchen. The bathroom is added to the main building but accessed from outside. It also has a storage room for tools and farming tools. Outside there is a shed for cars and a pool of 10×5 m work. It is a cottage, nothing more. Economic, easy to maintain, sufficient for use weekend and enough space for to enjoy short holiday periods. Within reach of most “pockets” and meets its main purpose that is none other than having a place of leisure and family gathering. Luxury villa in Chella, 100% private, 3 bedrooms, pool and garage. Detached villa, 3 bedrooms, located at Xàtiva. Negotiable price.